I won’t lie, folks, I’m flagging. Flagging hard. I’m on Week 2 of Grading Fest 2009, and although the end is now in sight and I know this is a temporary hell that i’m in and not a permanent one, and that I will one day return to fanciful knitting thoughts and exciting new Finished Objects…I am kidding myself if I say that today is that day. I had a short list of gift knitting items that I wanted to make this year – maybe 4 or 5. Not too many, I thought, especially since I started a month ago and I thought that was pretty decent. Well, as it happens, in that month I have managed to crank out exactly 1 Christmas gift so far. Actually, that’s a lie – I’ve got 75% of a gift: one and a half socks out of a pair for my Grandfather. He will wear them with great happiness and really, if you’re going to prioritize knitted gift recipients, I say definitely prioritize who-ever is at the top of the family tree. But still, they are men’s size 12 navy blue stockinette socks and even my transit knitting time has been beaten down, much the same way my creative zest has been pummelled by the Grading Fest assault. But I digress. Today, on a 24-hour self imposed grading hiatus and very necessary trip to the mall for gift needs, I had an epiphany. 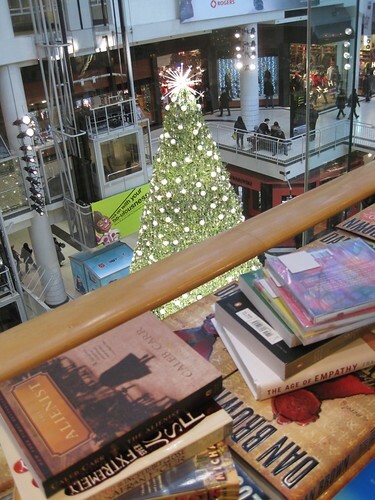 It wasn’t the surprise over discovering that one can still purchase the original New Kids On the Block Christmas CD, or the quiet rage over booksellers’ insistence that young women’s reading preferences are limited only to things with vampires in them, or even the gentle relief that comes with realizing that if the lines at Chapters-Indigo are than damned long, then at least that means people are still reading things. No. It was the dawning realization that although it can take a person a month to knit one gift, you can buy 5 in less than an hour. We’re knitting an uphill battle, folks. Consumerism is so EASY. It is not, however, easy enough to induce me to purchase discounted Halloween cookies in the middle of frakking DECEMBER, Williams Sonoma I’m looking at you. Tonight my 24-hours-of-no-grading are still in effect. I have hopes for the return of the beaded lace. With possibly the extra degree of difficulty of knitting while drinking a cosmo. (I play Denial at advanced levels). Happy knitting, folks, and may your gift knitting (however much of it there is) be in whatever state you want it to be. My dad was a college professor for a little while, and for years he said the stress of finals and grading killed his holiday spirit. I think the 24 hr hiatus was probably a good move. You’ll get through the rest! Merry shopping! Today when half the office crowded into my cubicle to peer out the window and watch the Olympic torch stroll by, I saw the perfect opportunity: “Everyone knits a row before you leave!” I proclaimed, and dragged out that stubborn never-gonna-finish project I’ve taken to carrying everywhere with me. But my plan backfired when they all decamped to a cube with a better view, leaving my sad half-knit cowl in a heap. Hmph. I have a feeling it’s Chapters for me, too. Good luck with the rest of the grading, and I hope you make it to the other side soon! 50% off? They should be handing them out at the door with free coffee. So funny…maybe because I’m there with you. My knitting list has continued to shrink by the day. But I’m still dumb enough to think, “Well, maybe I COULD make one more hat before Christmas.” I did have the good sense not to promise anything to anyone so those who don’t get, won’t know the difference. I commend you for going to the mall. Hope there’s something left by Monday. That will be my “do or die” day. Good luck with the grading. Oh I feel your pain! And yes, it is too easy to pop into a mall and find something (although I’m limited by the serious lack of amenities and choices in my little ole town). I too am not finished with the gift-making (mostly knitting and some scrapbooking) and I started in August (well it was the end of August, but still . . . ! I gave up on Christmas knitting last year as it was just causing me too much stress. What with that and the grading, don’t forget to make a little time for you!! It is discouraging to to realize how fast shopping is compared to knitting. This year I knit WAY too many gifts, and I’m promising to never do that to myself again! Wow, out W&S got rid of theirs ages ago (75% off). Bean loves those cookies, so I can usually bribe her with them. 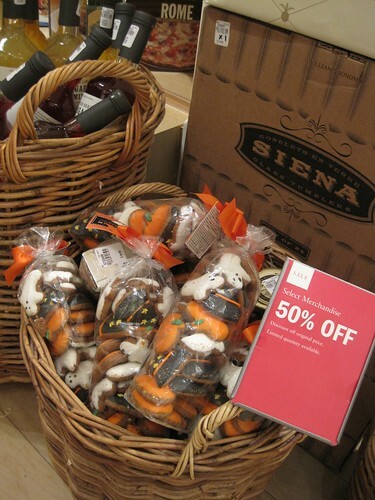 Guess Wm Sonoma hasn’t figured out what an insult the Halloween cookies are–50% off the day after Halloween, 75% after that, then into the employee breakroom! I had decided not to succumb to Xmess Knitting Madness, until that bug bit me on something like the 5th of December. I’ll be turning in some not-quite-finished gifts. Yesterday I had to tell my son’s teacher that I was not going to finish her gift before school got out for the holidays (that would be today). I managed to finish the gift for my daughter’s teacher ages ago, but this one is sucking the life out of me. Thank goodness I’d decided to only make the two gifts. Unfortunately with my 50% record, I think I may have to give up gift knitting altogether. Or maybe plan to start them before (US) Thanksgiving. Oh my god, is it wrong of me to be a little bit happy that someone else is also going through grading hell? My 24 hour self imposed grading moratorium is being spent on… writing my final paper for a class. RRRGH. I had such ambitious Christmas knitting plans, which have turned into 66% of socks and 1/2 a hat. BUT I have learned Cat Bordhi’s Möbius cast-on and have discovered that I can knit a neckwarmer in less than three hours. This, THIS is gift knitting. I once told and english teacher friend of mine who was grading papers while watching our sons’ lacrosse game that she should hand one paper out to each of the parents in the stands and see how we do. She demurred. I’m knitting a aran vest for my sister which was supposed to be finished by her birthday LAST JANUARY and I’m still finishing it. Maybe this birthday (if she’s lucky). Yeah, I’m trying to finish, too.